Work Experience (No. Yrs. )* For how long have you been working? Apply In* When do you intend to apply? Universities accepting meetings now,Hurry up! Discover the right fit programs for you, speak to admission teams and get your questions answered before you decide to apply. Schedule on-demand online meetings with Masters & MBA Admissions Teams worldwide. Now you don’t have to wait for them to travel to your city to get your questions answered. Register for Virtual One-to-One. Check your eligibility & qualify. Schedule Meetings. Have a 30-minute exclusive online conversation with the representatives of your preferred schools. Connect with global admissions teams recruiting students worldwide. Gather insights on your chances of an admit. Make an informed application decision. We'll help you to do that. How Do The Virtual One-to-One Meetings Work? Here's a step-by-step guide to how the Virtual Meetings work. Candidate registers for Virtual Meetings and submits his/her profile. V121 algorithm matches the submitted profile with the preferences set by the participating institutes. Only matched candidate profiles qualify to submit meeting requests with the corresponding institutes. 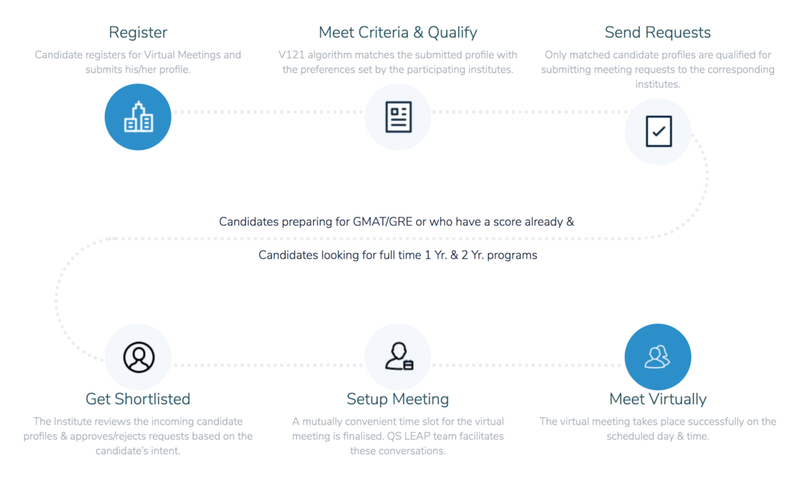 Only matched candidate profiles are qualified for submitting meeting requests to the corresponding institutes. The Institute reviews the incoming candidate profiles & approves/rejects requests based on the candidate’s intent. A mutually convenient time slot for the virtual meeting is finalised. QS LEAP team facilitates these conversations. The virtual meeting takes place successfully on the scheduled day & time. Proud to guide 2,00,000 students to their dreams.